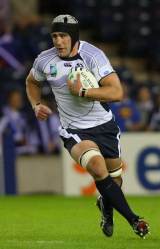 Scotland flanker Kelly Brown is the current captain of the national side and has the ability to lead the team into the 2015 World Cup if he stays injury free. He made his international debut in a 39-19 win over Romania in June 2005, scoring a try in the process. And at the time of his debut he was playing his club rugby for Border Reivers, but following the dissolution of the side in 2007 he joined Glasgow Warriors. In his journey to becoming an important member of the Scotland pack, he had turned out in the age groups and he realised his dream of playing in the Six Nations in 2007 when appeared against England. He was later selected for Scotland's 2007 World Cup squad and appeared in all five of their games en route to their exit at the quarter-finals stage. He then appeared in all of Scotland's games of the 2008 Six Nations, starting against Wales and Ireland, before making replacement appearances in both of Scotland's summer Tests with Argentina. After missing out of the autumn internationals Brown returned to the Scotland squad for the 2009 Six Nations. In tandem with his Glasgow team-mates John Barclay and Johnnie Beattie, Brown became part of the 'Killer Bs' back-row at both domestic and Test level. During the 2010 Six Nations the trio starred, but it was not enough to prevent Brown trading Glasgow for the Premiership and Saracens. In his first season at Sarries, Brown took the Aviva Premiership crown before embarking to New Zealand with Scotland for the World Cup. Brown played in three of Scotland's four Pool matches before their group stage exit but emerged from the tournament as one of their better players in what was a disappointing campaign. Going into the 2011-12 season, Brown was on fire for Sarries and played a key role in their dominant back-row vying with the likes of Jacques Burger and Ernst Joubert. He was pencilled in to lead Scotland into the 2012 Six Nations but he was ruled out of the tournament with a knee injury he sustained during a Heineken Cup match with Treviso. The injury was worse than first feared and he had to wait until their match with the All Blacks in November 2012 to next play for the international side.